Imagination can be found in strange and enthralling places. In a time of shlock and awe, Hollywood needs to look at ‘foreign’ cinema to see how story, character, and heart can be masterfully injected into a movie. In 2009, a $30 million (chump change by modern blockbuster standards) South African sci-fi drama obliterated preconceptions regarding the ‘popcorn movie’, CGI’s potential, and apartheid. That movie was the surprise hit goo-fest District 9. 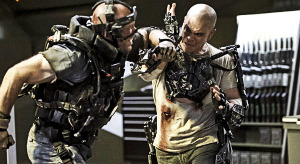 Director Neill Blompkamp’s follow-up, Elysium, is the inferior yet entertaining big-budget pseudo-remake. I’m not saying Elysium is a lazy and cynical sci-fi action flick. I’m simply suggesting that Blompkamp could’ve, and maybe should’ve, reached higher to justify his immense popularity. Before I piss anyone off, I’ll state my affection for this enjoyable and enterprising sci-fi smash. It’s an underrated and inventive movie unafraid to discuss major 21st century issues. This movie begins with a young boy being punished for stealing. After developing affection for a female classmate, he believes he’ll become Earth’s most important citizen. The movie then jumps several years into the future (2145, to be exact), and Max Da Costa (Matt Damon) has become the furthest possible thing from what his younger self had in mind. At this point in time, Earth has become a decayed and overpopulated mess occupied by disheartened people and expansive favelas. The wealthy few have emigrated to a giant satellite called ‘Elysium’, protected by Secretary of Defense Jessica Delacourt (Jodie Foster). Suffering police brutality whilst on parole, this skilled ex-con must adapt to the dangerous skeleton-like labyrinth of Los Angeles. Thanks to a workplace accident, a fatally concentrated exposure to radiation gives De Costa five days to live. 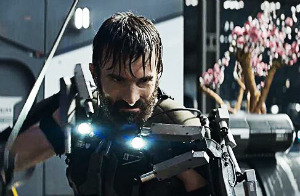 Hunted by a creepy and vicious government agent, Kruger (Sharlto Copley), De Costa’s fight for survival has the potential to change Earth and Elysium for the greater good. District 9 is essentially a powerful concoction of Independence Day and City of God. It addressed South Africa’s on-going issues with flair, potency, and panache. Elysium may not be as resonant or intriguing, but still contains many important messages and ‘f#ck yeah!’ moments. Here, Blompkamp has arguably established himself as this generation’s James Cameron. Taking on powerful stories and entertaining sci-fi action tropes, he stands above other budding sci-fi filmmakers (no offence, Joseph Kosinski). Unlike Kosinski’s Oblivion, Elysium triumphantly establishes itself when, where, and how it needed to. Thankfully, Elysium isn’t bogged down by slow pacing or a disengaging narrative. Like this year’s other sci-fi/apocalypse action flicks, Blompkamp’s film looks at humanity during a time of chaos, dystopia, and war. Unfortunately, considering the immense talent on display, Elysium doesn’t stand above 2013’s blockbuster crop. Blompkamp needed to bring originality and verve to this heavy-handed premise. This movie, if anything, proves he excels with visual composition and action-direction but should give his scripts more time to gestate. Like Cameron and George Lucas, Blomkmap’s reach exceeds his grasp during the script-writing stage. His screenwriting, though not terrible, throws too many contrivances and cheesy moments at the audience. Blompkamp’s filmmaking idiosyncrasies, however, are immensely gripping and sophisticated. This story, though blunt, is tangible and enthralling due to his purposeful yet glorious direction. In fact, Elysium‘s greatest aspects are found in its dialogue-free moments. The movie opens with immaculate sweeping shots of Earth and Elysium. From a thematic standpoint, these scenic, vertigo inducing vistas are conclusive and thought-provoking. 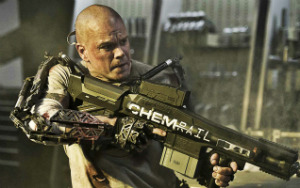 Blompkamp’s intention is, obviously, to draw parallels between Elysium‘s universe and our own. The stark contrast between the broken-down, ‘third-world’ Earth and pristine satellite-based ‘habitat’ is obvious yet momentous. From the first flashback onward, there are are a plethora of metaphors and symbols alluding to important events and current affairs. Discussing such issues as military/government control, the 99% vs. 1% feud, asylum seeking, equality, overpopulation, and Obama-care, Elysium is, somehow, more topical and overblown than Blompkamp’s previous works. One standout scene, in which Da Costa is confronted and beaten by robot policemen, looks into the treatment of minorities by authoritative forces. The problem, however, is that Blompkamp throws messages/conversation starters into the story without following through on them. His agenda is nowhere near as emotionally or thematically deep as it was in District 9. However, the movie’s greatest asset is Blompkamp’s attention to detail. Suited for I-MAX, his visual style is awe-inspiring and meaningful. Combing impressive practical effects with expansive yet efficiently used CGI, Elysium is a jaw-dropping and poignant sensory feast. Blompkamp also brings his affection for gore and advanced weaponry over from District 9. 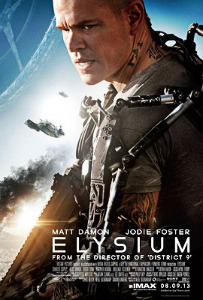 Featuring exploding bodies, creative action choreography, and unique technological devices (including an ailment-curing MRI scanner), Elysium may be 2013’s most imaginative big-budget movie. “The only thing I can do to help you is leave, I promise you.” (Max (Matt Damon), Elysium). This nostalgic yet competent fusion of 80s, 90s, and 00s sci-fi action flicks – specifically Total Recall, Blade Runner, Terminator 2: Judgement Day, and Children of Men – is bolstered by engaging action set-pieces. Blompkamp keeps the silliness to a minimum as the ‘junkyard meets Apple Store’ aesthetic, shaky-cam, and slo-mo push each sequence along. The shootouts and fistfights, making good use of Da Costa’s peculiar and iconic back-brace device, are thrillingly handled. Shot and edited with precision, the final set-piece becomes a sci-fi version of Mortal Kombat. Despite the explosions and lavish settings, it’s the performances that make Elysium whole. Despite Elysium‘s discomforting lack of wit and depth, the A-list actors, for the most part, elevate their archetypal characters. Able to inject magnetism and sympathy into any role, Damon becomes a likeable screen presence here. Despite his character’s abrasive personality, Damon’s physicality and compelling performance perk up the conventional role. Embodying polar-opposite characters in 2013 thanks to Elysium and Behind the Candelabra, his range and ambitiousness are commendable facets. As a desperate, lonely, and angry ex-government attack dog urgently needing a leash, Kruger is one of Elysium‘s many magnificent creations. His uncontrollable rage and psychotic tendencies liven up this earnest affair. Copley delivers another quirkily dark turn under Blompkamp’s direction. Unfortunately, Foster is under-utilised in a one dimensional and over-the-top role. It doesn’t help that the character’s villainous socio-political motivations are as bafflingly silly as her wavering accent. Like many of 2013’s low-four-star blockbusters, Elysium has several outstanding concepts and memorable sequences. Making Blomkamp and Copley even bigger names, it pushes boundaries and showcases some talented individuals. Hopefully, Blompkamp will stay behind the camera rather than in front of the keyboard. Verdict: An ambitious and jaw-dropping follow-up to District 9. Worst part: The Michael Bay-isms. Remember the 1990s? 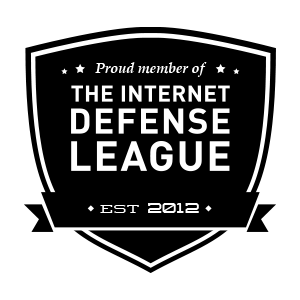 It was a far more peaceful time – back when boy bands ruled the airwaves, The Fresh Prince of Bel Air skyrocketed to mega-popularity, and Internet Explorer was still relevant. As a 90s kid, I look fondly back on this time and continually find more glaring similarities and differences between then and now. In the 90s, Miami, Florida was home to one of the most shocking crimes in US history. Action-comedy Pain & Gain is the ‘Michael Bay-directed’ account of this tragic event. Mark Wahlberg, Dwayne Johnson& Anthony Mackie. I used quotation marks in the previous sentence to make a specific point about this movie. Bay (Armageddon, the Transformers trilogy) is one of the most controversial directors in tinsel-town history. Many blame him for the death of modern cinema (Pearl Harbour was undoubtedly a huge misstep!) and continually criticise his ear-and-eyeball-shatteringly-brash style. However, his bombastic popcorn flicks have supported many careers and studios (dammed with faint praise). 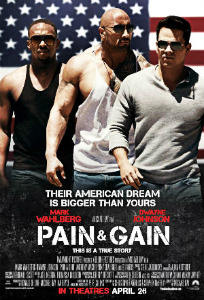 Since his filmography is a mixed bag (to say the least), Pain & Gain may just be his magnum opus. This hauntingly vile yet exciting and visceral action-comedy repeatedly states that it’s ‘based on a true story’. In the first three minutes, we see body-builder Daniel Lugo (Mark Wahlberg) impressively performing sit ups shortly before running from a barrage of policemen. The movie then steps back a few months, and Lugo is working for the man. Lugo, an over-worked yet optimistic personal trainer at Miami’s Sun Gym, is forced to work with high-paying client Victor Kershaw (Tony Shalhoub). Inspired by self-help guru Johnny Wu (Ken Jeong), Lugo asks work-mate Adrian Doorbal (Anthony Mackie) and ex-con Paul Doyle (Dwayne Johnson) to help him kidnap Kershaw and steal all his worldly possessions. 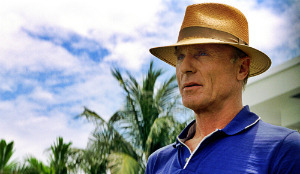 However, their incompetent plan is met with hostility from Kershaw, former detective Ed Du Bois III (Ed Harris) and Miami’s steamy criminal underbelly. What follows is a tale of violence, tyranny, anguish, emotional turmoil, and dream chasing. Yes, this movie is a stew filled with chases, enviable settings, disturbing violence, and A-list actors (you know, the ‘typical’ Hollywood movie ingredients). However, Pain & Gain startlingly deviates from what a standard run-of-the-mill action-comedy would do. Turning this horrific yet though-provoking true story into a relentless farce is a bizarre premise in itself. Here, Bay throws preconceptions of all kinds out the window. His idea of the ‘American Dream’ is clichéd and shallow, but it makes for a topical, discomforting, and enthralling movie-going experience. Pain & Gain clearly suggests that life is not worth living unless you have reasonable goals, a can-do attitude…and enviable possessions. In keeping with these pessimistic messages (such as they are), Bay’s superficial world (seen in all of his movies) is depicted here as a lugubrious, slimy, and morally weak black hole. Bay’s mean-spirited and chauvinistic creation knowingly points out the dangers that come of economic turmoil and unadulterated obsession. Thankfully, the familiar yet refreshing crime-thriller aspects keep this controversial movie in check. Throughout Pain & Gain, Bay alerts us to that split second when the lead characters go from laughably bumbling morons to villainous, delusional, and selfish delinquents. Despite the aforementioned abrupt tonal shifts, Bay makes sure the audience can ably laugh at, but never with, the three anti-heroes. Ultimately, Bay proves with Pain & Gain that he has the potential to create gleefully satirical, dark, and multi-layered action flicks (and who on Earth saw that coming?!) Despite Pain & Gain’s glowing positives, Bay’s sexist, racist, homophobic, manic, and atmospheric directorial ticks are on display once again. His crass/frat-boy-like filmmaking style/sense of humour overshadows everything he touches. Bay’s repetitive and abrasive approach may test well with audiences, but he needs to branch out if he wants to be treated like an adult. If Hollywood were a high school, The Coen Brothers would be the popular, talented kids whilst Bay would be the nerdy youngster with a creepy yet obvious crush. In fact, Pain & Gain, conceptually and narratively, draws major comparisons to Burn After Reading and Fargo. However, whereas those crime-dramas are consistent, intelligent, and punchy, this movie fails to come up a clever, original or subtle stylistic choice. Bay delivers yet another blood, sweat, and expletive-filled universe. The 90s, by this movie’s standards, glistens with jaw-droppingly gorgeous bodies, bright lights, bold colours, and stereotypical comic reliefs. For some reason, many shots zoom through bullet holes and around characters. I’ve also never understood his obsession with low angles, explosions, and gratuitous slo-mo. Unequivocally, It’s the Bay-isms that distract from what the movie is trying to say about wealth, masculinity, power, and friendship. “Jesus Christ Himself has blessed me with many gifts! One of them is knocking someone the f*uck out!” (Paul Doyle (Dwayne Johnson), Pain & Gain). If you find True Romance/Out of Sight-esque crime-capers annoying and pretentious, you should probably check out Now You See Me instead. 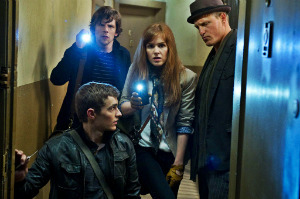 Like Now You See Me, the A-list cast elevates the mediocre material. Unlike that movie, however, Pain & Gain isn’t entirely brainless. Aided by the enjoyably silly yet unique narration, this movie highlights the aesthetic and magnetic qualities of its performers. Wahlberg’s enigmatic and captivating screen presence elevates his strange yet fascinating role. Used to playing hard-nosed cops and criminals, Wahlberg could’ve done this in his sleep. However, his wacky character is a steroid-filled shot to this movie’s heart. Emulating such masculine figures as Tony Montana, Rocky Balboa and Michael Corleone (“I watched a lot of movies Paul, I know what I’m doing!”), Lugo believes his muscle-fuelled lifestyle will bolster his ridiculous and disgusting get-rich-quick scheme. Despite his dim-wittedness, Lugo’s blissful ignorance and persistence are, at points, hilariously charming traits (similarly to his Boogie Nights character). The Stand out performer here is Johnson. Coming off G.I. Joe: Retaliation and Fast and Furious 6, Johnson has established himself in 2013 as the next Arnold Schwarzenegger/Sylvester Stallone-type action hero. Able to inject charisma, physicality, and grit into any role, Johnson in Pain & Gain balances wit, magnetism, and an inhumanly muscular frame to turn in a nuanced performance. His hysterically zany character, obsessed with Jesus and Cocaine (what a combination! ), is a truly affecting and disturbing creation. I hope we see more of Mackie after his enjoyable performance here. Shalhoub, Jeong, and Harris deliver charismatic turns in small roles. On the other end of the spectrum, a little of Rebel Wilson’s ‘comedy’ goes a long way! Turning this impactful true story into a pulsating action-comedy would’ve been an ambitious and incomprehensible task. However, Bay has done a remarkable job with allowing us to laugh at these absurdly dumb characters. Pain & Gain is an outlandish, insane, and lurid movie about the American Dream. Verdict: A relentless, punchy yet bizarre action-comedy. Worst part: The convoluted plot. Magic is a lost and polarising art form. Culturally preconceived as a hobby taken up by lonely, nerdy individuals, magic, like all other art forms, can be lauded when done perfectly and with panache. Las Vegas is known to be a hotspot for talented tricksters and cunning performers. It’s a form of entertainment that was bound to be brought to the big screen sooner or later. Now You See Me may attract youngsters to magic, but adults will, most likely, see through the illusion and debunk its many zany and bafflingly stupid tricks. Despite the starry cast and slick visuals, this is one magic trick that is all set-up and no payoff. Jesse Eisenberg, Isla Fisher, Woody Harrelson, Dave Franco. It’s a silly, monotonous, and imbalanced action flick that doesn’t live up to its intriguing premise. Unfortunately, the cynical aura the trailers gave off is ever present throughout the movie. This type of Hollywood spectacle is reserved for families and friends who don’t want to think too hard about what they’re watching. Thankfully, the movie starts out simply and effectively. We are introduced to four talented yet snarky illusionists striving to become strong parts of the magician community. The magicians – J. Daniel Atlas (Jesse Eisenberg), Merritt McKinney (Woody Harrelson), Henley Reeves (Isla Fisher), and Jack Wilder (Dave Franco) – are mysteriously summoned to an abandoned apartment by an anonymous benefactor. One year later, the four of them hit the Las Vegas casino strip and form a wondrous magic show. Labelling their act ‘The Four Horsemen’, their continuously sold out shows involve the plucky magicians robbing millions of dollars from banks and distributing the money into the crowd. After a French bank is robbed during a frenzying performance, The FBI, primarily represented by agent Dylan Rhodes (Mark Ruffalo), and Interpol, represented by agent Alma Dray (Melanie Laurent), are quick to jump on the case. However, the FBI will also have to deal with professional magic trick debunker Thaddeus Bradley (Morgan Freeman) and insurance magnate Arthur Tressler (Michael Caine). 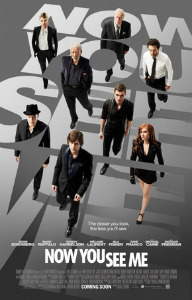 Now You See Me is The Usual Suspects without the ambition, a compelling story, and believable characters. 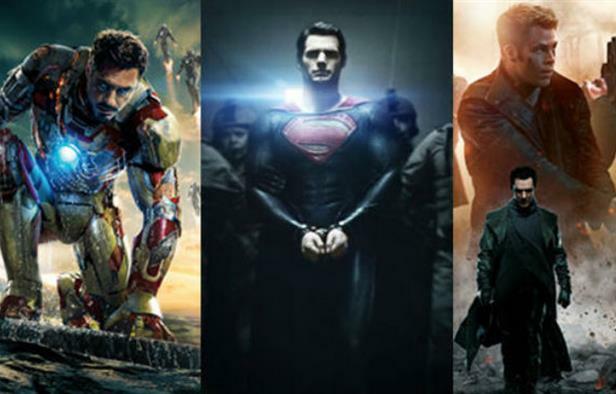 This disappointing movie proves just how strange 2013’s Hollywood blockbuster season has been. This year, in particular, has showcased many risky projects handled by extraordinarily talented people. The world of magic and Hollywood entertainment, if you go by this movie’s entertaining premise, are entirely similar. However, Now You See Me is as cliched, lifeless, and forgettable as the good ol’ ‘Hat-Trick’ (you know, the rabbit one). After being introduced to the four magician characters in a breezy first few minutes, the movie starts to slowly but assuredly unravel. From the eerie meeting scene onward, the movie is bogged-down by exposition, annoyingly cheesy anecdotes, characters used as plot devices, and bumbling comic reliefs. Make no mistake; this is certainly a ‘studio’ movie. It contains a plot that can’t decide what it wants to do or where it wants to go. Many scenes treat us to useless, corny dialogue that serves only to forcefully move the convoluted and exhaustive narrative along. However, the first third is intriguing and punchy. Combining some imaginative scenes (including a surprisingly entertaining hologram-based induction for the four magicians) with the hilarious comedic moments, this movie had the potential to be something magical (zing!). Unfortunately, the movie skids off the rails when the FBI and Interpol are brought in, and then spectacularly crashes in the final third. Despite containing a few hysterical moments, including a pulsating and kooky interrogation scene in which the four magicians toy with agent Rhodes (“The first rule of magic: Always be the smartest guy in the room” is a cracking line), the movie’s cat-and-mouse chase story becomes exasperating and inconsistent. The focus inexplicably switches from the four exciting magicians to Rhodes, Dray, and Bradley. Thanks to this sudden shift, the pace and tone are distorted. The movie works well when it’s at its absolute quirkiest. The enjoyable back-and-forth dialogue, shared between the likeable Robin Hood-esque characters, establishes the light-heartedness this hyper-kinetic movie needed throughout. The movie is also sorely affected by the flashy direction. Unlike Christopher Nolan’s masterful direction in The Prestige, Director Louis Leterrier (The Tansporter 2, The Incredible Hulk) tries to liven up each scene with his overbearingly obvious flair and sleight of hand tricks. With quick cuts and swishing camera movements, Leterrier makes it difficult to comprehend the crime-caper story, entertaining magic tricks, and inventive action set-pieces. Leterrier’s style wavers between insistent and bland – unable to capture the vibe of stimulating crime-capers like Ocean’s 11 and The Sting. It doesn’t help that Now You See Me‘s CGI overload removes awe and tension from the intriguing narrative. However, the fist-fights and car chases are masterfully handled. In one enlightening scene, Wilder uses magician’s props to stop agent Rhodes in his tracks – making for a well-choreographed and zippy set-piece. “First rule of magic: always be the smartest guy in the room.” (J. Daniel Atlas (Mark Ruffalo), Now You See Me). Like a magician’s prop, character motivations and plausible decisions immediately disappear before your eyes. We are uninformed of the Four Horseman’s ambitions, Rhodes’ wavering motivations or why Dray is interested in this case at all. Also, the bumbling FBI squad makes more stupid decisions and unintentionally laughable blunders than Wile E. Coyote. However, the A-list international cast saves this movie from becoming a completely forgettable and mindless mess. The array of likeable and talented stars brings life and zippiness to the strange and two dimensional characters. In the first third, Eisenberg and Harrelson bring back the snappy rapport they developed in Zombieland. The immaculate chemistry between the Four Horsemen may help you to overlook the sheer implausibility of their expansive on-stage magic tricks and elaborate Italian Job-esque heist. Eisenberg, Harrelson, Fisher, and Franco, despite their ubiquity, are forever enjoyable screen presences. Harrelson and Fisher’s comedic notes hit and stick when needed. 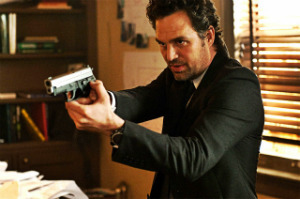 Ruffalo is a charismatic force as the bumbling FBI agent. Despite having to carry an underdeveloped sub-plot, he brings levity to his generic role. Freeman and Caine, despite their electrifying chemistry and effortless charm, seem to be phoning it in, whilst Laurent seems weirdly out of place compared to the wacky characters on display. Despite the zany comedic moments and enthralling cast, Now You See Me becomes a tangled mess due to its convoluted plot, preposterous plot twists, and baffling characters. Unable to decide whether it wants to be quirky or earnest, the movie lumbers toward its inexcusable conclusion. It may lead you up one path whilst distracting you from another, but the journey is still tedious and inconsistent. Verdict: A slick, preposterous, and clinical action-caper. Best part: Pegg and Frost. I could’ve sworn I reviewed this movie a couple of weeks ago! I recall that it starred a bunch of popular comedic actors whom cracked jokes and banded together to out-live the apocalypse. My point here is that the disaster-comedy I’m describing, This is the End, and the movie I’m currently reviewing, The World’s End, are entirely similar. This disaster-comedy double-up suggests that many big-name comedic actors, producers, and directors, no matter what side of the Atlantic Ocean they are from/on, are fascinated by the apocalypse. Although it’s a major step up in quality from the aforementioned Seth Rogen-starring farce, The World’s End is a significant step down from Shaun of the Dead and Hot Fuzz (the previous instalments in the Three Flavours Cornetto trilogy). Don’t get me wrong, I love seeing creative actors, writers, and directors going out of their way to deliver ambitious movies/TV shows/web-series’ etc. In fact, despite my nitpicks, I gladly admit this third instalment has many unique and commendable aspects. 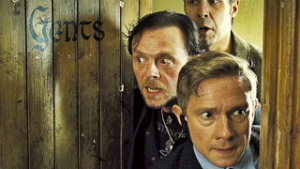 similarly to this series’ previous instalments, The World’s End starts out small. Alcoholic layabout Gary King (Simon Pegg) is blissfully unaware that his best days are far behind him. Sporting the same black, leather coat and manic persona he affably displayed throughout high school, King’s latest idea may forever change his life. 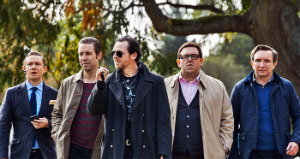 King rounds up his old, and now successful, chums – Andrew (Nick Frost), Oliver (Martin Freeman), Steven (Paddy Considine), and Peter (Eddie Marsan) – to conquer a pub crawl, they tried and failed to complete back in high school, known as ‘The Golden Mile’. Heading back to Newton Haven (their old stomping ground), the five of them aim to reach the twelfth and final pub, fitting titled ‘The World’s End’, before the town’s inhabitants can halt their quest. Nick Frost & Paddy Considine. Writer/director, and pop-culture icon, Edgar Wright (Scott Pilgrim vs. the World) puts 110% into every project he’s involved with. Similarly to Joss Whedon and Shane Black, his clever and snappy filmmaking style has developed many memorable cinematic moments. 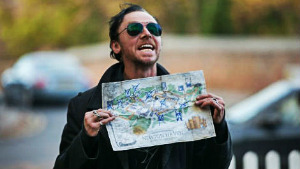 He, Pegg, and Frost hit the big time with Shaun of the Dead and Hot Fuzz. With that in mind, I realise it would be difficult to forge a movie comparable to the two aforementioned cult-classics. Here, Wright and co. have created a kinetic, satirical, and witty sci-fi-adventure romp. Moving at a consistent pace from the wacky prologue to the bizarre epilogue, the movie smartly discusses the biggest and scariest adventure imaginable: life itself. The movie delivers an understandable tale based around friendship, honour, humility, and regret. I’m guessing we would all love to sit back and relax all day, every day (like Pegg’s character). The movie, however, suggests that we should forever be looking for something, and someone, worth fighting for. Along with its positive messages, the movie is an intelligent and reflexive ode to such sci-fi creep-fests as Invasion of the Body Snatchers, They Live, and The Thing. But with Hollywood currently going gaga for nostalgia, The World’s End also proves that reminiscence can be a misguided an uninspired thing. Centred around a damaged yet intriguing lead character, and a Big Chill-esque reunion, the movie states that looking back on the past can grievously harm the present and future. This enjoyable and hysterical farce takes several dark and demented turns along the way. Despite using the From Dusk till Dawn method of showing first and explaining later, This is the End, unfortunately, isn’t as reckless and surprising as it wants to be. Several plot points are picked up and dropped without warning. Also, the movie has a peculiar reliance on video-game-like action set-pieces and chases. Despite the quality of each bar-room brawl and pulsating montage, there are, perhaps, too many – hurriedly shifting the tone from darkly comic to gleefully silly and vice versa. When the action kicks in, tension and pathos are instantly sucked out of this otherwise heart-warming movie. 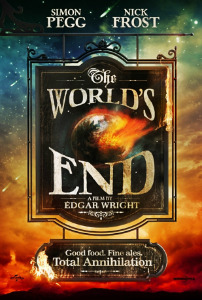 The World’s End also succumbs to repetitiveness in the second two thirds – rushing from one dingy, small-town pub to another. Despite the movie’s issues, the key ingredients, needed to make an instant action-comedy classic, are all here. The action sequences are expertly shot and choreographed – rivalling many set-pieces from this year’s big-budget extravaganzas. Applying similar directorial ticks to those seen in Scott Pilgrim vs. the World, Wright’s poised and awe-inspiring visuals illustrate his potential to tackle much larger projects (seriously, when is production on his Ant-Man movie going to start?!). The alien/robot creations, which show up at the film’s halfway point, are also perplexingly nuanced. These blue-bloods may not rule the commonwealth, but they do pack a punch! Speaking of ‘hits’, the laughs also come thick and fast. Despite the movie’s fair share of poignant moments, the clever back-and-forth dialogue becomes the movie’s most memorable aspect. “A man of your legendary prowess drinking f*cking rain?! It’s like a lion eating Humous.” (Gary King (Simon Pegg), The World’s End). It’s obvious that Wright, Pegg, and Frost work extremely well together. Beginning their careers back in the late 90s/early 00s with sci-fi satire Spaced, their shared love of ‘genre’, subversion, and referencing is heartily injected into The World’s End. Here, the references and in-jokes are evenly scattered around each homely, comforting setting. Despite the movie’s cynical and dour outlook, the cast does a grand job of lifting the viewer’s spirits. Here, Pegg shows he’s more comfortable working with Wright and Frost in lowly British towns than being on Starship Enterprise voyages and impossible missions. Playing against type, Pegg proves he can inject likability and quirky charm into any role. His role, as the group’s leader and foul-mouthed, manic man-child, could easily have become grating and shallow. However, Gary’s personality traits, some more pleasant than others, are exposed in an enlightening way. Frost, the yang to Pegg’s yin, is a charismatic and engaging presence. His character is a realist who, fittingly, fights on his own terms. Punching windows and hitting robots with bar-stools, his character becomes a total badass at the opportune moment. Like with Wright’s previous movies, the supporting players are also top notch. 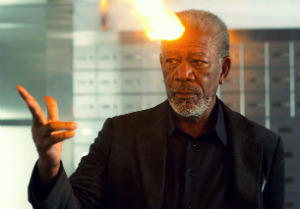 Freeman, fresh off his portrayal of Bilbo Baggins, livens up his otherwise conventional role. Character actors Considine and Marsan are refreshingly chirpy. As is Rosamund Pike as Gary’s old flame/Oliver’s sister. Featuring smash cuts, smash zooms, and smashingly enjoyable moments, Wright and co. deliver a messy yet indelibly creative ode to notorious sci-fi/horror flicks and action-comedies from their youth. It may be the lesser instalment of the trilogy, but it has enough discernible qualities to warrant a trip to the cinema with your mates. Verdict: A flawed yet pacy, witty, and clever conclusion to the Three Flavours Cornetto trilogy.